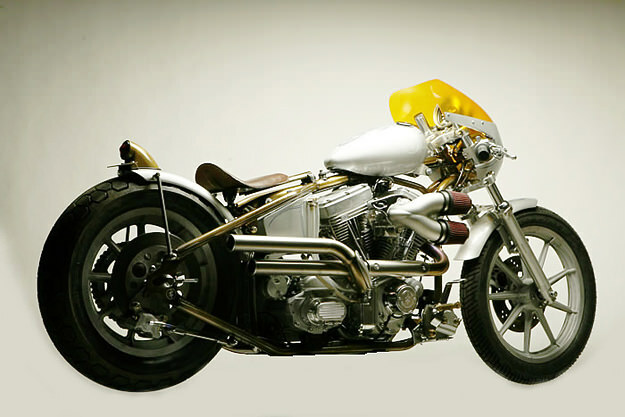 Zero is one of the most iconic names in custom motorcycles. The founders of the ‘Samurai Chopper’ movement opened shop in Okazaki City in 1992, and last year set up an operation in Las Vegas. According to Zero, the Bullet Train “started as an in-house project to use up some of the old parts we had laying around the shop. We wanted to build a bike with a vintage drag racer feel to it.” The name is apt: power comes from an S&S 113” motor with tuned induction, putting out around 120 hp and hooked up to a custom-made titanium exhaust system.